نزدیک باد روز آزادی یاران سبز! As we approach the parliamentary elections and the deadline for candidates to register for the elections, Saham News conducted a short interview with Fatemeh Karroubi, the wife of opposition leader Mehdi Karroubi. Given that the vetting process for parliamentary candidates is about to begin, there has been much discussion regarding whether or not reformist candidates should participate in the upcoming elections. In your meetings with Mr. Karroubi did you have an opportunity to ask Mr. Karroubi, former head of the parliament about his opinion regarding this matter? What can you tell us about his latest condition and circumstances? As you are aware, Mr Karroubi has been under house arrest for over 300 days. Thanks to the grace of God and the prayers of our nation, my husband is in good spirits, remains strong and determined, sending his warm felt greetings to all our free spirited compatriots. Workers in Tabriz protest against the anti-union labor laws and call for the Minister of Labor to resign. They also protest against the high unemployment that plagues Tabriz and for the many months of unpaid wages. In an open letter addressed to Iran’s Supreme Leader Khamenei, Mostafa Tajzadeh, incarcerated member of the Central Council of the Islamic Iran Participation Front objected to his wife, Fakhrolsadat Mohtashamipour’s recent trial and the subsequent threat to issue a prison sentence against her. With all due respect, I write you this letter not because I wish to complain about the oppression and crimes committed against my friends and I, nor do I hope or expect to change your position and perspective regarding the affairs of our country or warn you about the current path our country is on; for these matters have been brought to your attention, although to no avail, both directly and indirectly over the recent years by many a great individuals whose intelligence, experience and integrity cannot be denied. As for us, we have made a covenant with our God and we continue on this journey trusting his judgment and putting ourselves in his all knowing hands. We have no expectations of kindness what so ever of any of God’s creations. Regardless of whether or not the revolution was successful in conveying this message in the first decade after its inception or the subsequent decades since, and there is much room for discussion and criticism of how effectively this message was conveyed, there is no doubt that this issue was very close to the heart of the late Imam Khomeini. In his letter to Gorbachev, he did not encourage him to transition from Marxism to democracy and freedom, for that is a path that humanity is inevitably taking today. The Imam’s intentions with his letter to Gorbachev as noted in his meeting with Eduard Shevardnadze was to open the doors to the heavens above to Mr. Gorbachev. That letter had only one message, to convey that the challenge did not lie in Gorbachev’s support of Marxism and was much deeper than his support of dictatorship or denial of basic rights and liberties, but rather his denial of morality, spirituality and divine laws. The Imam was warning Gorbachev to avoid falling into the trap of the material world and becoming a slave to consumerism, avoiding the same mistakes made by capitalistic societies in the West. Today we are witnessing the uprising of one Muslim nation after another, standing up against tyranny and humiliation, overthrowing dictatorial regimes in their quest to experience a new world and a better life. If their goal is to pursue science and technology and the further development of their country and their personal financial well being, then without a doubt, given the current inflation, unemployment rate, zero growth in GDP and declining economic conditions, all a direct result of the mismanagement, incompetence and inefficiencies of the current ruling government, it is best if you and I recommend that they not use Iran’s current model as one to emulate! If their goal on the other hand, is to adhere to a high standard of ethics and spirituality, qualities that were integral to the message of our revolution and distinguished it from all other revolutions, as the leader of the Islamic Republic, are you able to provide them with any tangible and practical examples of such achievements by the regime? Do you plan to point them to the lies, deception and most significant corruption in the history of our nation? Or will you speak of the generosity and humanity that government officials have shown towards our citizens? Undoubtedly, the security agents were also in the dark regarding Mr. Khavari, even though they are aware of every single detail regarding the private lives of the families of political prisoners in Iran, even going as far as threatening our citizens and intimidating and preventing their children from getting married. We never imagined that morality and humanity in our country would digress to such a degree that children would be deprived of a right to an education in Iran and abroad as a result of the activities and efforts of their fathers, let alone fathom the idea that their personal lives and future would be put in the hands of interrogators and security agents. We never dreamed that humanity and dignity would be ignored so such a degree in our country that the children of political prisoners fearful of being banned from leaving the country and as such deprived of an education would not dare to travel to their mother’s country and mothers would also be banned from leaving the country as a result of the activities of their husbands and as a result be deprived of seeing their children who live abroad. Proponents of Velayat-e-faqih in Iran [Supremacy of the Jurist] in support of this doctrine argue that in order to execute the will of God, one requires power. Is cutting off the financial means of critics and proponents, pressuring their families and depriving their children of basic human rights such as the right to an education, the divine limits upon which velayat-e-faqih was established in Iran? You undoubtedly remember as well as I do that when Mr. Banisadr went in hiding before leaving the country, his family was arrested based on the orders of one of the judicial authorities so that he would be forced to turn himself in. At the time, the late Ayatollah Beheshti was very disturbed when he heard of this news and in addition to making sure that the judicial authority in question was punished, he ordered the immediate release of Banisadr’s family. Mr. Banisadr, subsequently fled the country and his family who were also not banned from leaving the country eventually joined him, so that I would be in a position to proudly recount this story today as a beautiful example and remind your excellency of the lost humanity, morality, spirituality in our nation. I neither associated with Mr. Banisadr, nor have I participated in any uprising against the regime with the likes of the MKO (Monafeghin). Fortunately, because I was arrested immediately after the elections, it is difficult at best to attribute imaginary charges such as conducting a velvet revolution, launching protests and encouraging people to participate in anarchy and chaos to me. I have fortunately also not fled the country, but rather remain behind bars in your prison. Explain then why my wife who has done nothing but protest my arrest and incarceration, writing letters to her husband on her web blog, should be arrested in plain day light, accosted by security agents and transferred to solitary confinement? Explain why, she has now also been put on trial because she spoke out against the injustices imposed on her husband? Our master Imam Ali once addressed those who viewed him as an infidel, stating that the following three rights will be respected with regards to them: 1) We will not deprive you of public funds, 2) We will not prevent you from entering a mosque in order to pray and 3) We will not fight with you unless you start the fight. But the officials following your orders have deprived Shiites and their families and children of not only the nation’s public funds, but also of their jobs and a right to an education, only because they protested against the injustices committed against them. They are arrested and put on trial only because they dared to hold prayer services, asking God for the release of their husbands and those who sought to help them financially have been sent to solitary confinement. I have been in prison for approximately 2 1/2 years. During this time because I published my opinions regarding the challenges facing our nation in a completely legal manner, I have been illegally held in solitary confinement. My intention in writing this letter as previously stated is not to complain, nor do I expect you to address the oppression that is inflicted on your behalf. I only ask you one question. According to what moral criteria do the judicial authorities under your Excellency have the right to arrest my wife and put her on trial in an effort to pressure me and silence me from expressing my opinions with regards to the matters that concern our nation? I do not worry about my wife being accused or arrested. Sentencing her will not prevent me from expressing my opinions regarding the matters that concern our nation. I have no doubt that my partner in life views this oppression and injustice as the continuation of a price we both chose to pay. My daughters also have a God who is kind, compassionate and holy on their side. I keep thinking about the fate of a regime that is on such a downward spiritual and moral spiral and the heavy price that our citizens will have to pay. All I know is that what is being practiced today in the name of religion and a religious state has no relation what so ever to religion and the authorities responsible for such acts have no relation with God or religion. روز گذشته دانشگاه مازندران شاهد یکی از گسترده ترین تجمع های اعتراضی خود در سال های اخیر بود. به گزارش دانشجونیوز، در روز یکشنبه از حدود ساعت ١١.٣٠ ظهر، دانشجویان دانشگاه مازندران ظرف های غذای خود را از سلف دختران و پسران تا ساختمان اداری سلف چیده و در مقابل این ساختمان دست به تحصن زدند. این تجمع در حالی شکل گرفت که در هفته ی گذشته بیش از هزار نفر از دانشجویان دانشگاه مازندران در نامه ای به شورای صنفی، اعتراض خود را به کیفیت نامطلوب غذای سلف دانشگاه و خوابگاه ها اعلام کرده بودند، با این وجود پاسخی از سوی شورای صنفی یا سایر نهادهای ذی ربط دانشگاه دریافت نکرده و تنها شاهد امنیتی تر شدن فضای دانشگاه بودند. بنا بر گزارش دانشجویان مازندران، نیروهای حراست، لباس شخصی و بسیج بارها سعی نمودند ظرف های غذا را جمع کرده و جمعیت را متفرق نمایند که با اعتراض گسترده دانشجویان مواجه شده و از این کار صرف نظر نمودند. در این تجمع یکی از دانشجویان بیانیه ای را قرائت نموده و مطالبات صنفی دانشجویان را بار دیگر به مسولان دانشگاه گوشزد نمود که با حمایت و تشویق دانشجویان حاضر در تجمع مواجه گردید. از جمله مشکلات صنفی ای که در این بیانیه به آن اشاره شده است می توان از بد بودن کیفیت غذا، افزایش بیش از صد درصدی نرخ غذا نسبت به ترم گذشته، ظرفیت پایین و وضع نامناسب خوابگاه ها، برخورد بد حراست با دانشجویان علی الخصوص دختران و… نام برد. In an interview with Kaleme that took place five days ago, Mir Hossein Mousavi and Zahra Rahnavard’s daughters reiterated that they have had no contact what so ever with their parents for more than 50 days. They believe that their parents have been incommunicado because of the decisive remarks they made to a judicial authority who was present during Mousavi and Rahnavard’s last visit with their family and because their comments were subsequently published by a the Green media outlets. Mousavi’s daughters are convinced that the authorities wish to ensure that their parents remain isolated and more importantly will continue to do everything in their power to prevent their voices from reaching the nation of Iran. When was the last time you heard from Mir Hossein Mousavi and Zahra Rahnavard? After our father’s decisive exchange with a judicial authority who was present at our home during the month of Ramadan, all communication with our parents was completely cut off. It has been more than 50 days since we had any news of our parents. A few days ago, however, they contacted our grandparents and said that they were fine. They also contacted one of our relatives based on some random criteria only known to them and allowed this relative to visit with our parents on that very same day. We three [daughters], however, have been completely deprived of hearing our parents’ voices and seeing them in person. The relative allowed visitation with our parents informed us that they are healthy and in good spirits. Do you think that they have deprived you of all communication with your parents as a result of your father’s harsh exchange with the judicial authority present at your house during their last visit? We believe that the reason why our parents have been rendered incommunicado yet again is two fold. Firstly because of the manner in which they confronted the judicial authority present during our last visit with them and secondly because we reported the events that occurred and published some of our parents’ comments, an act that has angered them. It looks as though they have adopted a new tactic, allowing visitation by individuals whom they themselves select (although this last visitation occurred after seven weeks of complete isolation and lack of news). This new tactic is clearly designed to create the impression that our parents are allowed visitations, when it is clearly not the case. Why was Mr. Mousavi upset on that day? What led to the decisive exchange of words with the judicial authority? We believe they allowed our father to leave Pastor street [Mousavi’s residence] and he was brought to our house with the intent to have a dialogue and come to some type of agreement. The decisive manner in which our father dealt with the judicial authority from the very start, however, made it very clear that he was not interested in any discussion of that sort. Please describe your parents’ physical and mental condition during your last visit. They were in very high spirits. In fact a few times when it was mentioned that God willing they will be released soon and this nightmare will be over, my mother insisted that they only wish to be free if all other political prisoners are also freed. She was very adamant when she made this statement. We could sense her “joi de vivre” and their continued belief in their convictions. It goes without saying that both our mother and our father were completely healthy prior to their arrest. Their heavy schedule of activities and regular checkups are a testament to their strong physical condition prior to their arrest. In this last visit, there was no sign of the extreme weight loss we had witnessed during the third to fifth month of their incarceration. Even though it was Ramadan and they were both fasting, they both looked healthier and in good physical condition. When we told father about the rumors published by media outlets affiliated with the ruling government claiming that his physical health had deteriorated, he reiterated that these reports are nothing but lies, confirming that they are both well. We believe that these reports are attempts to divert people’s attention from the real news and challenges facing our country. Has a trusted physician of the family’s choice been allowed to view their medical records? No, despite our insistence, they will not allow us to see their medical records. The Head of Prisons in Iran claims that they have a strong medical team. When we responded that we neither trust him nor his medical team, he stated that it is our problem not theirs. Are Mousavi and Rahnavard still under pressure? Can you describe their living conditions? The first three months were apparently very difficult to endure. Of course they have yet to explain what exactly happened to our parents during those months and we are not too eager to ask. Naturally, in an attempt not to worry us, our parents generally don’t talk about their living condition. There are certain things however that we coincidentally saw or heard about. For example, we noticed that iron bars were installed on all the windows in the house. The entire house and the street leading to the house is filled with cameras and spotlights. Our parents have been incarcerated on one floor, with iron bars on their windows with absolutely no communication with the outside world. It goes without saying that this type of behavior has been very difficult for us to endure, but our father has always reiterated that he is not bothered by all this pressure and he is thankful to God for giving him the opportunity to work towards his goals and ideals. They continue to pressure our parents by ensuring that they remain incommunicado for long periods of time while feeding them lies about us three daughters. They also pressure them by threaten to have us arrested because of the few vague reports we have published regarding our parents. Let us not forget that except for the day our grandfather passed away, when our father was only allowed to briefly come to our late grandfather’s house for about twenty minutes and even then under extreme security measures, our father has not been allowed to see any of his family members. How are they doing emotionally? How do they endure not being able to see you and their grandchildren? Do they miss seeing them? Has the pressure on you and your family decreased or are the conditions the same as the first days of your parents’ incarceration? We are pressured and they threatened to take us to court and to throw us in jail if we speak out. They claim that a case has been filed against us in court and each time we speak out a new charge is added to our case. 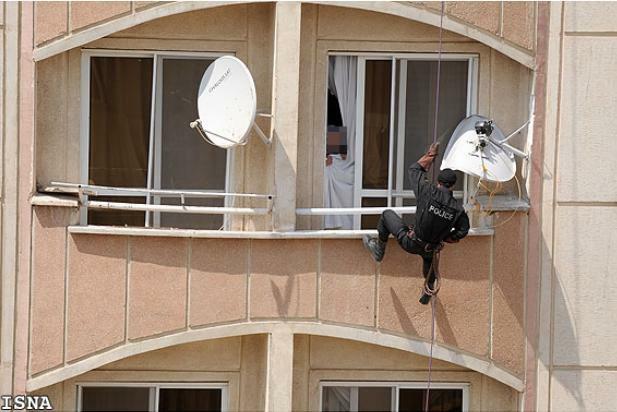 In the past other family members who were in contact with Mousavi and Rahnavard were pressured by security forces. Is this still the case? Yes completely. As soon as we do something, they immediately begin to pressure the other members of our family. When they complain and ask what it is that they have done, the security forces respond that they are fully aware that our family members have not done anything, but they are being pressured because the daughters of Mousavi have published news about them or met with someone. All our family members are constantly being harassed. There is almost no one left in the family that has not been pressured or harmed. To make matters worse, they even threaten our friends. They even made sure that one of our friends failed their university entry exams. Another was arrested. Another was expelled from university while yet another was summoned to court. They claim that we are all in contact with the MKO. Thank god that the traitors and terrorist groups such as the MKO and other such rogue groups are continuously insulting our parents and expressing hostility towards them. It goes without saying that our parents and our family have always drawn the line, explicitly stating our position when it comes to these groups. Not withstanding the pressures exerted upon your family by the judicial authorities and security agents, how are your personal lives? Are your lives effected as a result of the current circumstances? The pressure is extreme. We are constantly threatened to be fired from our jobs and we receive other threats. When we go out in the street, they follow us. We received letters from the Revolutionary Court stating that we have been banned from leaving the country. We have all been banned from leaving the country. This ban was recently reinstated. We don’t comprehend why they would imagine that we would be willing to leave the country given the current condition of our parents. Where would we go? Is any place safe these days? The Ministry of Intelligence also sent us a letter informing us that Mousavi’s children are currently not allowed to change careers. It goes without saying that meetings, discussions (interrogations) both by phone and in person have also taken place. Does Mousavi receive any of this news? In general what news if any and from what source is made available to your parents? We cannot be sure of the type of news if any, that is being provided to our parents, but as stated previously our father once said: “Is it possible to figure out what is going on in the country and in the world when hearing only one word? I am a veteran politician. I am fully aware when you feed me with half truths, incomplete news or even the opposite of what has really occurred.” Our father also emphasized once: “I can read in between the lines and decipher what the real truth is regardless of your censorship and lies.” It is for this reason that our father’s analysis of the events in the region has not changed since his arrest. Anyone who has the slightest familiarity with Mousavi, is fully aware of the characteristics you just mentioned. Why do you suppose he is being treated this way? Do you mean to say then that they are aware of the current events? The news is completely filtered before it is delivered to them. For example, they had heard about the news in Bahrain, but knew nothing of what is going on in Syria. If they are aware of anything it is because of their intelligence and their ability to put two and two together, deciphering the next piece of the puzzle. Do they prevent you from providing them with the news? Do the prison authorities and security agents also deny that your parents have been arrested in their discussions with the family? What term do the security agents use in lieu of prison? They try to avoid the subject altogether. This last time, that is 50 days ago, they stated that protecting the regime is of utmost importance to them and currently the regime has deemed it necessary that the conditions be this way. They did not explain however, what they meant by “conditions”. Our parents insist however, that this condition is nothing other than prison. Iron bars have been installed on all windows and doors. The security agents are inside the house whenever they please. We cannot say for sure however if our parents are even in their house at the moment, for we have had no news of them in almost 8 weeks. Describe to us the actual visits with your parents. What are they like? At the beginning, a few times, we were taking to another building. There is a smaller room inside the room where the person who is supposedly in charge of the prison guards usually sits. There is also a female security guard who is always literally stuck to our mother’s side. She won’t even let go of our mother’s dress even when mother is preparing to pray. There are also other agents present at all times. They used to allow us to visit in the yard. On our third visit, when the political prisoners were fasting in protest to what had happened to Hoda Saber and we had also published a few words regarding this issue, the security agents stated that the yard would now be off limits. 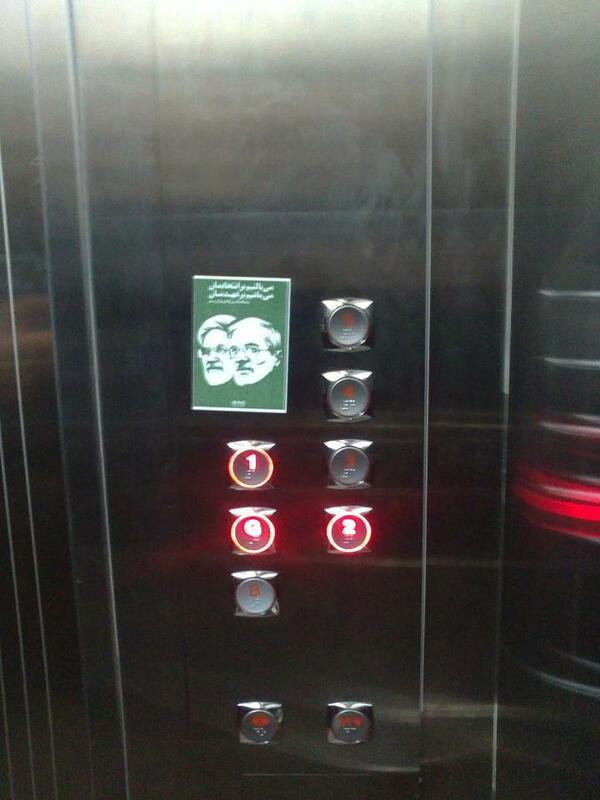 People want to know if Mousavi and Rahnavard are indeed being kept in their own home. Can you shed any light on this matter? Even we don’t know for sure where they are. Two three months ago, after our parents had disappeared once again, this time for 40 days, we went in front of our parents’ house. We rang the bell outside the iron gates that have now been installed at the entrance of the street. An individual answered. We stated that we would like news of Mousavi. The individual asked who were. We responded that we are his daughters. His reply was “Who is Mousavi? There is no Mousavi here. This is our house.” We said ” This used to be Akhtar street, but you have blocked it. There is only one house on this dead-end street and that house used to belong to our father.” We kept insisting and they kept denying that Mousavi does not live on this street. A few days ago we went once again outside Akhtar street and they stated that if a judge provides permission they will allow us to see our parents. There is a God however, and God knows that we had predicted these days long ago and our parents had prepared us for ever more difficult days. It is during these times that we say to ourselves we are heavy hearted along with so many other families who have loved ones behind bars. How often have people been in touch with you during this time? We were not in touch with anyone. We were always told not to get involved in politics. We weren’t really interested in making noise, not because we were unaware, after all when you grow up in a political family you become exposed to that world. In reality we were not in touch with anyone. After the house arrest, however, where ever we go, our friends, colleagues and anyone who recognizes us treats us with such kindness and respect. Everyone has expressed their concern regarding our parents’ situation. Given Mousavi’s position after the revolution, have any government officials contacted you or inquired about your well being? Mr. Khatami is the only person who has contacted us. He has visited both our grandmother and our aunt and uncle. There have been other Ayatollah’s and friends who have contacted us and asked how we are doing and it goes without saying that we are grateful to each and every one of them. What do you believe are the positions of Mousavi and Rahnavard in relation to the martyrdom of Haleh Sahabi, lashing sentences against our youth or the heavy sentences rendered against Narges Mohammadi and Nasrin Sotoudeh? Even though we cannot speak on their behalf, there is no doubt that if they were not in prison, our parents would speak out against these events. Our mother has always been active, particularly when it comes to women’s issues. They believe in defending people’s rights and have dedicated their lives to this cause. In reality their entire life both before and after the revolution has revolved around such issues. Setting aside the issue of defending ones rights, this is also an emotional matter. My mother for example was very close to many of the women’s rights activists. She had even named the flowers in her house after many of them, particularly those who were behind bars. She misses them and thinks of them all the time. She loved martyr Haleh. Every time there was talk of the political activities prior to the revolution, she often brought Haleh up and spoke of her honorable family and her sweet and loving personality. How can one ignore or ever forget such deep friendships? 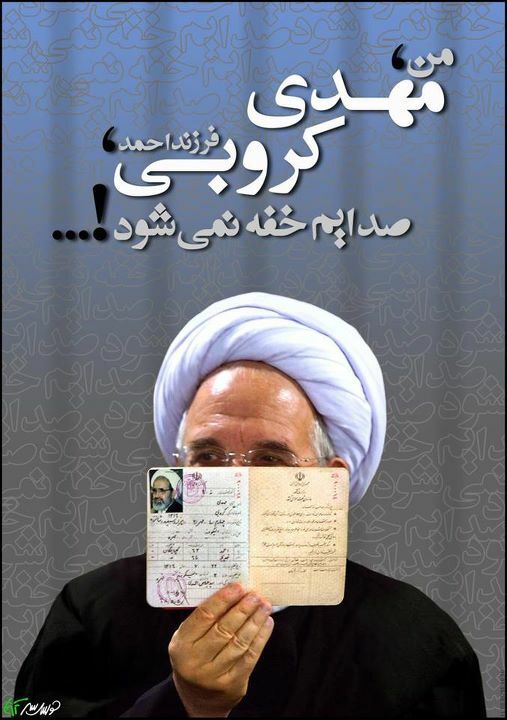 The social networks recently pointed to a book that Mousavi had recommended that everyone read. Can you please expand on this issue? During one of our visits, father asked whether we had ever read the novel “News of a Kidnapping“ [by Gabriel Garcia Marquez] and we said that we had not. He said that the book was very political and very similar to what had occurred to them. That visit passed and we forgot the name of the novel father had mentioned. The next time we visited with our parents when we were bidding them farewell, we remembered to ask about the name of that novel father had once mentioned. He whispered the name of the novel in one of our ears. Father behaved as though he was giving us a warning. He was very cautious and alert. Given that he whispered it in our ear, we felt as though he was giving us some sort of message. In conclusion, is there anything you would like to say to our citizens? The truth is, we have been under extreme pressure under the past 8 months. Much of what has happened cannot be talked about. If there are complaints about the lack of news regarding our parents or why the news was not published sooner, it is because many a times it is not possible to talk or publish such news. Our hearts are with the families of those who have lost their loved ones and those who have loved ones behind bars. If we say anything it is to inform and perform our duties as daughters. When ever things become unbearable, we tell ourselves that there are many who have dealt with similar issues for years. We would like to once again extend our gratitude to all those who remember us and have prayed for us during these difficult 8 months. We are also grateful to our kind and understanding colleagues at Kaleme who have always been supportive of us. Sorry, your only allowed state propaganda ma’am! به گزارش دانشجونیوز، دانشجویان معترض دانشگاه زنجان در تجمع روز سه شنبه هفته گذشته اعلام کرده بودند، در صورتی که دیوار میان بوفه پسران و دختران این دانشگاه برداشته نشود، مجددا در روز یکشنبه تجمع اعتراضی برگزار خواهند کرد. تجمع گسترده دانشجویان ظهر روز گذشته با خواندن سرود «یار دبستانی» آغاز و با سر دادن شعارهایی در مخالفت با طرح تفکیک جنسیتی مانند «تفکیک جنسیتی، توهین شخصیتی» و همچنین شعار «دانشجو می میرد، ذلت نمی پذیرد» ادامه یافت. روز سه شنبه ۱۲ مهر ماه نیز صدها تن از دانشجویان دانشگاه زنجان در اعتراض به اجرای «طرح جداسازی جنیستی در بوفه این دانشگاه، جداسازی اتوبوس های سرویس دانشجویان و همچنین اجرای طرح تفکیک جنیستی در کتابخانه ی فنی و مهندسی»، در محوطه این دانشگاه دست به تجمع گسترده زده بودند. Our perserverance is our sword, Our unity is our shield, AZADI… is our destiny! A special note we would like to share with the brave and beautiful women of Iran; You have shown extraordinary courage, passion, pride, humility and humanity in the face of great injustice. The world has taken notice and we are all humbled by your strength and determination. If you are the future, then we all are comforted by how bright it will shine.